Ribosomal protein S6 kinase 1 (S6K1) inhibitors are currently under investigation for treatment of type 2 diabetes mellitus (T2DM), as systemic insulin sensitivity is increased in S6K1-deficent animals. However, mice lacking S6K1 are also hypoinsulinemic, have smaller pancreatic β cells, and display a reduced body size. Sung Hee Um and colleagues at the University of Cincinnati demonstrate that loss of S6K1 also leads to impaired placental development and intrauterine growth restriction (IUGR), a frequent complication of human pregnancy that limits the supply of oxygen and nutrients from the placenta to the developing fetus and is associated with a reduction of embryonic β cell growth and the onset of T2DM later in life. Restoration of placental development and amelioration of IUGR by tetraploid embryo complementation did not restore β cell size and insulin levels in S6K1-deficient embryos, suggesting that loss of S6K1 leads to an intrinsic β cell lesion. 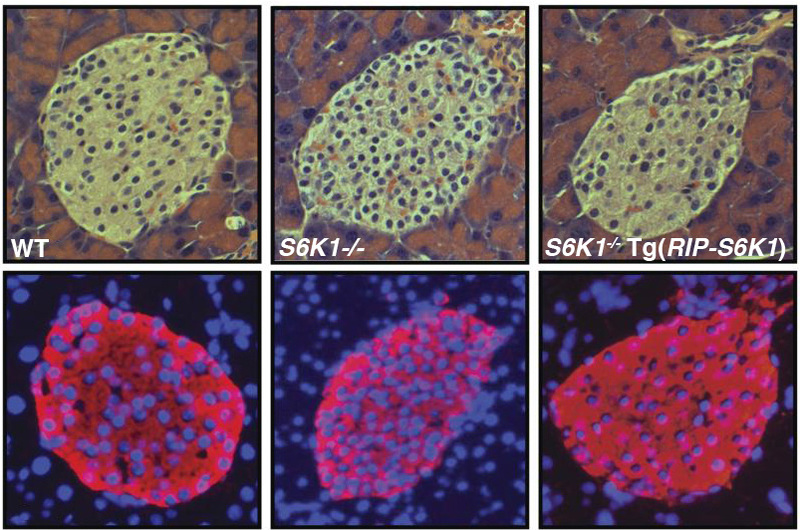 Consistent with this hypothesis, re-expression of S6K1 in β cells of S6K1-deficent mice restored embryonic β cell size and insulin levels but failed to rescue the body size. Together, these results indicate that a reduction in S6K1 signaling during fetal development, rather than IUGR, may be the cause of reduced β cell growth and the eventual development of T2DM later in life. The accompanying image shows pancreas tissues sections from 3-6 month old WT (left), S6K1-/- (center), and S6K1-deficient mice with β cell-specific restoration of S6K1 (S6K1-/- Tg(RIP-S6K1), right) stained with H&E (top row) or stained with Hoechst (blue, bottom row) in combination with immunofluorescence staining for insulin (red, bottom row). Note β cell size is reduced in S6K1-deficient mice and this defect is ameliorated by restoration of S6K1 expression in β cells. Citation Information: J Clin Invest. 2015;125(7):2736-2747. https://doi.org/10.1172/JCI77030. Type 2 diabetes mellitus (T2DM) is a worldwide heath problem that is characterized by insulin resistance and the eventual loss of β cell function. As recent studies have shown that loss of ribosomal protein (RP) S6 kinase 1 (S6K1) increases systemic insulin sensitivity, S6K1 inhibitors are being pursued as potential agents for improving insulin resistance. Here we found that S6K1 deficiency in mice also leads to decreased β cell growth, intrauterine growth restriction (IUGR), and impaired placental development. IUGR is a common complication of human pregnancy that limits the supply of oxygen and nutrients to the developing fetus, leading to diminished embryonic β cell growth and the onset of T2DM later in life. However, restoration of placental development and the rescue of IUGR by tetraploid embryo complementation did not restore β cell size or insulin levels in S6K1–/– embryos, suggesting that loss of S6K1 leads to an intrinsic β cell lesion. Consistent with this hypothesis, reexpression of S6K1 in β cells of S6K1–/– mice restored embryonic β cell size, insulin levels, glucose tolerance, and RPS6 phosphorylation, without rescuing IUGR. Together, these data suggest that a nutrient-mediated reduction in intrinsic β cell S6K1 signaling, rather than IUGR, during fetal development may underlie reduced β cell growth and eventual development of T2DM later in life.